We are happy to announce our newest research survey study which will evaluate the knowledge that primary care providers have regarding ASD symptomatology and their self-perceived competence in applying this knowledge while performing surveillance and using recommended tools for referral and diagnosis. Please check out the flyer below for more information, and contact us at lernerlab@stonybrook.edu or 631-632-7857 for questions! The SENSE Theatre Study is a performance based intervention targeting social skills that includes trained peer actors and theatre techniques. Tackling Teenage Training is an education program that involves teaching youth with ASD about psychological, social and sexual development. The intervention is no cost to you and involves research visits before and after the treatment in which your child will complete psychological testing, participate in some social interaction and complete some computer activities while being monitored via EEG. The intervention takes place over 10 sessions on Saturdays or weekday late afternoons. For more information and to learn how you can get involved, call us at (631) 632-7857 or e-mail lernerlab@stonybrook.edu! We are conducting a research study to learn more about the role that different factors play in kids’ and teens’ “real world” social functioning. This study consists of a few short visits to our lab, one of which includes a pizza party! This study will help us to better understand how effective social competence develops, and to create more effective and precise treatments for youth with ASD. We are recruiting children ages 11-17 with and without ASD! Check out one of the flyers below for more information about how to get involved! We are thrilled to announce our collaboration with the Autism Science Foundation in this initiative to support effective employment policy for individuals with ASD and to better understand the needs and improve the employment outcomes of individuals with ASD! Participation involves completing this online survey. Please check out the flyers below for more information, and contact us at lernerlab@stonybrook.edu or 631-632-7857 for questions! We are conducting an investigation into how adults (ages 18+) with and without ASD engage in their social world, and how specifically attending to social interactions may affect behavior. Participation involves visits in our lab at SBU, as well as using your smartphone in between visits to tell us about your social interactions. Please check out the flyer below for more information, and contact us at lernerlab@stonybrook.edu or 631-632-7857 for questions! If you are an SBU undergraduate student, log on to Sona to find the screening survey! Otherwise, contact us by phone or email to let us know you're interested. effective friendships. Please check out the flyer below for more information, and contact us at lernerlab@stonybrook.edu or 631-632-7857 for questions and to find out how to participate! For these and other ASD-relevant studies being conducted through the Stony Brook Psychiatry Autism Clinic, please click here. Upcoming studies will focus on lab-based games and tasks to improve understanding of processes involved in social interaction, as well as survey research exploring familial processes in families with and without ASDs. As we begin to recruit for these studies, additional information will be available here. In the meantime, feel free to contact us at lernerlab@stonybrook.edu! We'd be happy to answer questions you have, and you can ask to be added to our contact list to receive periodic updates as new opportunities to participate become available! what works best, and for whom. We are collaborating with a team of colleagues across Stony Brook University led by Dr. Kenneth Gadow in the Department of Psychiatry to conduct a PET/fMRI Brain Imaging study of adult (over 18 years old) men with ASD. Please see the flyer below for details, and then contact the ASD Brain Imaging Study at IMAGE_autism@stonybrookmedicine.edu or 631-638-1821 to learn more! We are conducting an online survey study with married mothers of children and teens ages 6 to 17 with and without ASD to learn more about the support they receive from their spouse. This study will give us more insight into the dynamics of families in which parents face varied demands of care taking. Please check out the flyer below for more information, and contact us at lernerlab@stonybrook.edu or 631-632-7857 for questions! We had the opportunity to work with colleagues around the country to develop the most comprehensive picture to date of the specific practices used in mental health services for children and teens with ASD. We recently published our most compelling findings from this work and look forward to continuing it! If you are a provider who works with individuals on the Autism Spectrum, stay tuned to see if you can get involved! We recently conducted a group social skills intervention study for children ages 8-17 with an ASD. 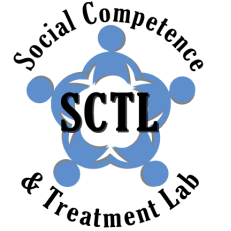 Our Social Groups took place for 1.5 hours in the SCTL once per week for 10 consecutive weeks. Before and after the Social Groups program, participating parents and children also completed questionnaires and computer activities. As a thank you for the time and effort of those who participated, parents could request a free individualized clinical assessment report for their child at the end of the study! Stay tuned for publications to come out about the insights the participants and these groups helped to teach us! This past year, we collaborated with investigators at Rush Neurobehavioral Center in Illinois to learn more about how children think about and understand social information, and how we can track this understanding with a fun computer activity. This study included participation from children ages 6 to 10 with ASD and their parents. Stay tuned for publications to come out about the insights these participants helped to teach us! We are collaborating with the lovely staff at ASPIRE Center for Learning & Development in Melville, NY, to see how children behave socially in real-world and simulated interactions. If your child is or will be participating in a social skills group at ASPIRE, ask your clinician for our flyer or contact us directly at lernerlab@stonybrook.edu or 631-632-7857 to find out how to participate. For more information on ASPIRE services, click here. Families who are not enrolled in a social skills group at ASPIRE also may be eligible to participate. If your child is between 7 and 14 years old and has been diagnosed with ASD, check out the flyer below! This past summer, we collaborated with the Spotlight Program of Northeast Arc in Danvers, Massachusetts, to continue the state-of-the-art research that has helped establish the program as a leading provider of evidence-based programs. Building on pioneering research that demonstrated unique effectiveness of the program, this study helped us to learn more about how Spotlight “works” – and works best – to help participants and families. Keep an eye out for publications to come about the key insights the families and staff at Spotlight helped to teach us. We recently conducted an online survey study on how various aspects of family life may affect kids and teens that have a brother or sister with an ASD. Megan E. Tudor, who earned her Ph.D. in Clinical Psychology from Stony Brook University in 2015, led this study as her dissertation project. Over 250 mothers of children with ASD participated! Stay tuned for publications to come about the valuable information these families helped to teach us.